This might seem ancillary, in the wake of Oscar Pistorius's transformation from "inspirational athlete" to "accused murderer," but the news that banned drugs were found in Pistorius's home may end up playing a major role in his trial—a line of argument by the prosecution or the defense. The Sun, citing police sources, reported that steroids were found during a search of the house when officers arrived to find Reeva Steenkamp dead from gunshot wounds. The Daily Mirror adds that there were "boxes and boxes" of unopened steroids found in a drawer, in "every form possible" including pills and syringes. The Mirror claims Pistorius told police they weren't his, and he was just holding the PEDs for a friend. South Africa's City Press reports that police specifically requested Pistorius's blood be tested for drugs—in anticipation, they claim, of a possible "roid rage" argument. At today's bail hearing, prosecutors raised the possibility that Pistorius flew into a rage upon learning Steenkamp received a message from former boyfriend, national rugby player Francois Hougaard. But, and this is pure speculation, a "roid rage" defense could also serve Pistorius. He's been charged with "premeditated murder," for which the prosecution will have to prove he knowingly and rationally planned to shoot Steenkamp, even if that "planning" happened in a matter of seconds. 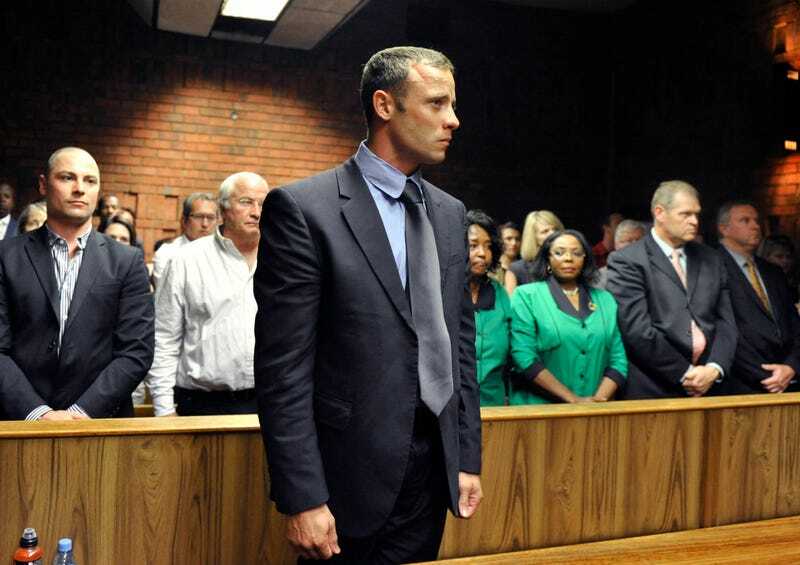 Pistorius could argue that jealousy, combined with the effects of anabolic steroids, made him not in his right mind when he pulled the trigger. That could be argued as a "crime of passion," or "temporary insanity," and unlike premeditated murder, wouldn't carry a mandatory life sentence.